The pink carnation symbolizes a mother's undying love and it is always given as a sign of gratitude. Thus, it is an ideal gift for mother's day. Mother's day 2015 is coming up, my siblings and I have been talking about the celebration on this Sunday... What kind of gift should I give to my mom? 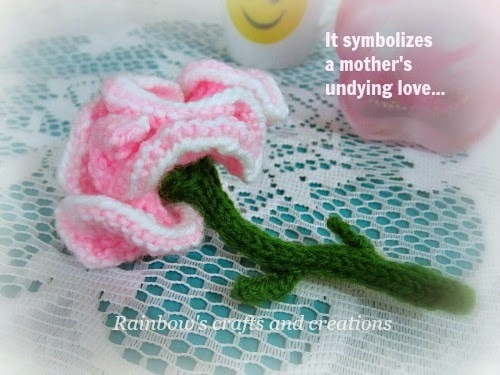 Could I try to knit a pink carnation instead of buying a gift this year? Yes, this special day inspired me to be more creative with knitting! I had finished my knitted pink carnation yesterday, would you try to knit one? 4. sewing needle & tapestry needle. The flower pattern is worked in flat but you can use circular needles due to a large number of stitches is required. Leave a 6 inches end and cut yarn. Knit this part (Row 1 to Row 8) in flat with a pair of double-pointed needles, so you have to turn your work every time you have finished a row. This part will be the calyx with sepals. Row 1 : Picot cast on (knitted cast on 4 stitches, bind off 2 stitches, transfer back one stitch onto the left needle) Repeat the steps until you have 5 picots and 10 stitches on your left needle. Don't turn your work, slide all the stitches to the other end of the double-pointed needle. Start using the I-cord method at the following part (start from row 9 until the pattern is finished). Row 15 : cast on 6 stitches, bind off 6 stitches, transfer the single stitch on the right needle back onto the left needle and knit to the end of the row. Row 19 : Knit 4 stitches, cast on 6 stitches, bind off 6 stitches. Thread the tapestry needle with the yarn tail/end coming from the bind off edge. Then fold the bind off edge of the flower in half twice, and press to form a cylinderical base so the petals (ruffles) are gathered together. Sew to secure the base with the yarn tail. Cut a piece of wire the same length as the stem. Insert the wire into the stem from the upper opening (refer photo no.1) and tuck the the wire into the cylinderical base of the flower. Wrap the calyx around the base of the flower, sew the upper opening, then sew the sepals in place. You can sew this part with the yarn tail coming from the cast on edge, so make sure you leave enough yarn before you cast on the stitches.